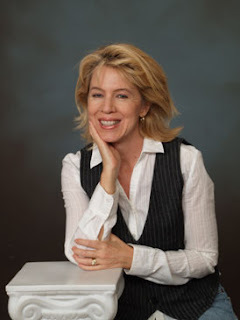 Today we are honored to welcome special guest author M.L. Tyndall. Hello my name is MaryLu Tyndall and I’m a tall ship-aholic! There, I’ve said it. Whew, it feels good to have that out in the open. Unfortunately, there are no groups to join to recover from this disease. The only thing that seems to work is to continually travel all over the US coastline in search of tall ships to board. So, let me start at my first port-of-call, Key West, Florida, where my then 18 year old daughter and I traveled to attend a local Pirate festival. Yes, pirates are another problem I have. This of course fit in with the theme of my first three novels about pirates in the 17th century, so I was quite excited. We were expecting the streets of the small island to be filled with pirates, wenches, Spaniards, and British soldiers, sword fighting and firing muskets and doing all kinds of piratey things. What we found was an old vacant fort with crumbling walls and about seven booths set up selling cheap pirate trinkets! What a disappointment. But it gets better. I had booked a cruise on a Pirate ship around the inlet. We were told that authentic pirates would be manning the schooner and cannons would be fired! What we got was an overcrowded boat with a vulgar crew dressed up like pirates. Beer and wine were passed around to all and as we lumbered around the bay, the crew became more and more inebriated! And me there with my daughter! At one point, a lady, decked out in a very salacious pirate dress leaned over and vomited over the side of the boat. The only saving grace was the firing of a couple cannons. After which I said a quick prayer for the drunken crew to sail us safely back to the docks. Now, that I think about it, perhaps the excursion was truly more authentic than I realized! Perhaps a bit too authentic. 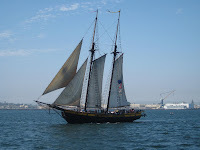 Next port-of-call, San Diego Tall Ship Festival! This time, I dragged my poor husband along, but he ended up having a blast. We boarded the Topsail Schooner, Spirit of Dana Point, a 2-masted schooner much like pirates used to sail. While we were out at sea, we were attacked by a pirate ship! I’m not kidding. Right away, our stalwart crew fired back upon the scalawags. You can see the smoke from our cannon as we fired. And here as our enemy swept by us. It was all very exciting. Thank God, we made it back to shore! Afterward, we were able to board the HMS Bounty, the very ship used in the film Mutiny on the Bounty! Here I am standing aft of the stern. But my favorite ship was the HMS Surprise. This was the same ship used in the film, Master and Commander! Can you imagine? I was in heaven. The frigate was the most glamorous type of ship in the British Navy. It was big enough to carry a significant gun power, but fast enough to evade larger enemies. Usually frigates were given independent roles such as escorts, commercial raiding and patrols. It often fought in single ship actions against enemy frigates. 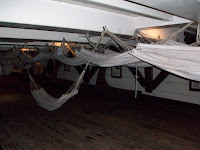 The frigate could house a crew of close to 200 men who lived, slept, worked and ate in very close quarters. Fresh water was a luxury and the men were usually given grog (water mixed with rum) to drink. Food consisted of dried meats and a biscuit called tack which was hard and crusty and often contained weevils. Next stop, Baltimore Harbor to board the infamous USS Constellation! 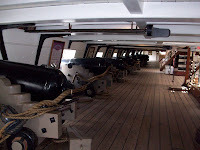 Now that ship has a fascinating history The USS Constellation was a 38-gun frigate, only one of the six original frigates authorized for construction by the US Naval Act of 1794. She was distinguished as the first U.S. Navy vessel to put to sea and the first U.S. Navy vessel to engage, defeat, and capture an enemy vessel. Sailing under Captain Thomas Truxtun, she embarked from the island of Saint Kitts on January 30, 1797 and encounted the French Frigate La Vengeance. La Vengeance attempted to run and had to be chased down. An hour after sunset Constellation overtook La Vengeance and a a cannon battle ensued. Twice the ships came so close that boarders nearly leapt from ship to ship. The second occasion was quite bloody as US Marines in the Constellation shot up the deck of La Vengeance leaving her deck covered in bodies of the dead and wounded, and forcing her boarding party to seek cover. After the encounter, the Constellation's incredible speed and power inspired the French to nickname her the "Yankee Racehorse." Constellation served in the Barbary Wars against Tripoli and the War of 1812 against Great Britian. 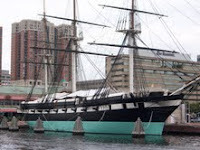 The ship that is now anchored in the Balitmore harbor is a reconstructed version of the original Constellation. The new US Sloop-of-War Constellation was launched in August 1854 and sent on diplomatic missions overseas as part of the US Mediterranean Squandron. During the civil war, the Constellation returned to the Mediterranean where she protected US Commerce and chased Confederatre raiders. I traveled to Baltimore to research the next series I’m writing entitled Surrender to Destiny. This series is set in Baltimore during the War of 1812. For those of you who don’t know much about the War of 1812, the main friction between the US and Britain revolved around shipping rights. The British were stealing men off of our merchant ships and impressing them into their navy. (As well as stirring up Indians to attack our frontier) Repeated attempts to stop them failed, finally resulting in a declaration of war. At that time, our navy only had 6 frigates, 3 sloops of war and 7 smaller vessels. Compare that to the British Royal Navy who had 600 Warships, 120 Ships of the line, and 120 Frigates! The British Royal Navy was the strongest and largest navy in the world. So when the USS Constitution beat the HMS Guerriere early in the war, it gave the US great encouragement that we could actually stand on our own against such a formidable enemy. Thank you for joining me on tall ships around the coast! I hope you’ve enjoyed your tour. I’m MaryLu Tyndall, signing off from the deck of the HMS Surprise! Ahoy there. Weigh anchor, raise tacks and sheets, and let’s get underway. We have a horizon to catch! The Raven Saint: When Grace Westcott is kidnapped by a French mercenary, tossed aboard his ship, and told she will be sold to a Spanish Don in Columbia, she cannot imagine what she has done to deserve such a horrid fate. She has spent her entire life serving God and helping the poor, not to mention trying to save the souls of her two wayward sisters. Thinking perhaps God has sent her to preach to the vile captain and his crew, Grace’s every attempt to correct their sinful ways is rewarded with only mockery. When Grace’s situation grows far worse than she could imagine, she is forced to face her own human weaknesses. But she isn’t prepared to face her biggest weakness of all—falling in love with the nefarious captain, Rafe Dubois. Captain Rafe Dubois hates nothing more than a religious pretence of piety. Fleeing a home of abuse and betrayal under the thumb of his self-righteous father, he became a mercenary upon the Caribbean. There isn’t any job, no matter how vile, he won’t undertake in order to amass the fortune he needs to build a hospital for the poor in his home town of Port-de-Paix. The praises of the people fill a craving in his soul for the self-worth and value he never received from his father, while giving him a sense of purpose for his otherwise reckless life. That is, until he meets the saintly Miss Grace Westcott who continually berates his every move. Will Grace discover God’s purpose for her on this harrowing journey? And what will she do when she realizes that purpose is not to redeem the wicked Captain Rafe Dubois, but herself. MaryLu will be stopping by today. Please be sure to leave comments and questions for her. Have you ever ridden on a ship? What kind? I have been to a tall ships festival and took a helicopter ride over it. Some where sailing up the river, most were docked. It was beautiful. I never miss an opportunity to board any ship, but I recall in particular the Constitution in Boston Harbor, and the Mayflower in Plymouth. Thanks for sharing your experiences, Mary Lu. They show in your books, which is one of the reasons they are so popular...one of the reasons! I love them and I hope your visit introduces you to some new readers. There is a beautiful sailing cruise ship in Norfolk called The American Rover that I've ridden several times, but it's not big enough to qualify for a "tall ship." I do love ships and sailing, though. Thanks for stopping by and sharing your love and passion for these magnificent vessels, MaryLu. While I am not quite a "ship-a-holic," I do love experiencing anything in the historical realm! I've actually been to both the Bounty and the Constellation. So very fun! I hope you made it to Ft. McHenry while in Baltimore. That was pretty cool, too. Thank you for sharing your experiences. I know your own adventures are what make your books so very fun to read. Have you ever seen the windjammers in Maine? There are 12 ships (half are National Historic landmarks) in the Maine Windjammer Association all within 8 miles of one another (Rockland and Camden) and a few others to see as well. In Camden they have a windjammer festival on Labor Day weekend where you can see them all in one harbor...a very cool sight! The Isaac H. Evans does pirate adventure cruises and they are geared towards kids (so no drunken crew barfing over the side!) I always love reading tales from a fellow tall ship-aholic! Do get The Raven Saint and its sister books, Red Siren and Blue Enchantress. You will love the heroes and have a lot of sympathy for the sisters. In Raven Saint, I love the way ML takes this rather sanctimonious woman and makes her faith real, not just posturing. ML and I were drawn together through our tall ship love. I saw the Bounty when I was twelve and probably that started mine. I got to sail on the HMS Surprise--called the Rose then, a replica of a ship the Briths sank in the Savannah River in 1780 to stop Americans from coming up the river. On that trip, though I have a deadly fear of heights, I climbed the rigging. the sway is really exaggerated up off the deck. 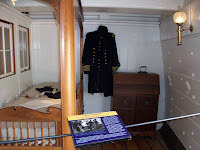 toured the Constitution in high school and saw the Providence, American frigate from the Revolution and much smaller. Pride of Baltimore II, which was a Baltimore clipper and the fastest thing on the water in the early 1800s. 1812 to be exact. So you see why I've become one of ML's biggest fans. Mary Lu, what a fun post. I'm so glad you visited us today. I love tall ships. I have to say, though, I've only seen one and only been on that one, the Lady Washington when she came to Whidbey Island several years ago. The Lady Washington has been in a Star Trek movie - Generations, and all three Pirates of the Caribbean movies. I don't know all of the history of this ship, but I think The Lady Washington is actually a replica of the real ship. But it was still a great experience. Oh, and Mary Lu, thanks for sharing the pictures. What a great post! I love reading about ships and pirates. You're an awesome writer and an awesome person. Pirates, Aye! I haven't read your latest book, but it looks great. Here in Cincinnati we have Tall Stacks every so often. Haven't been for several years. Who are you reading these days that inspires you? Just wanted to let you know that MaryLu is on the west coast, but I imagine we'll hear from her soon. Hi Ladies! Yes, it's not yet 9:00 AM here in California and I'm still sipping my coffee! Thank you all for your great comments and for taking the time to read about my tall-ship addiction! Debra, I'm dying to see the Constitution in Boston. In fact, I'm anxious to see that whole city. I hear it's filled with great historical sights. D'Ann, yes, I did make it to Fort McHenry! In fact, they were having a reenactment of the War of 1812 while I was there. You can see a video of it on my website. I loved it! Ahoy, Captain Brenda! no, I haven't had the pleasure of seeing the Windjammers in Maine, but now I see I need to add that to my list! So many ships, so little time. Thanks Laurie for dropping by! As you can see Laurie and I are tall ship buddies. In fact, if I don't know something, I usually go to her. Thanks for the kind comments! Suzie, yes, I've heard of the Lady Washington and am dying to tour it. I'm hoping it will come out west here soon. Hi Jill! Thanks for dropping by. I highly recommend reading Raphael Sabatini's Captain Blood. When I need inspiration, I usually pick up one of his books or one of the Hornblower series by C.S. Forester, or any book by Patrick O'brien. Great stories! Thank you all so much! And Thanks Dina and the Inkwell ladies for having me on.. I'll drop by later on today again! MaryLu, what a wonderful post. I loved the photos, too. As Deb said earlier, your expertise is just one of the many reasons your books are so much fun. I love how you weave the details of life aboard ship into the story. Your new book sounds intriguing! I can't wait to read it! Thanks for visiting the Inkwell. Mary Lu, I hope you get to Boston one day. I know you'll love it. It was my favorite 'city' to visit, until I went to Savannah. Looking forward to your next series! I did enjoy the tour and the pictures, thank you! I also enjoyed reading about your book. I truly enjoyed reading today's posting by MaryLu...loved the pictures, too. Looking forward to reading your masterpieces. Hey MaryLu, thanks for stopping by the Inkwell. I'm rather an afictionado of tall ships myself. To me they represent adventure. And they've shown up in two of manuscripts, although I did restrain myself and they did not find their way into the 1920's story. That was a fun tour! Thank you for the grand adventure. I saw the Bounty when it came to Portland Harbor, Maine! Hey MaryLu, love your books!!! I just rec'd The Raven Saint in the mail last week and am on a reading ration during Book in a Week this week so I haven't finished it yet. But I'm thoroughly enjoying it. Fits right in with my spirit of adventure. I touch a Tall Ship every time I pull my hand out my pocket because the two masted schooner Bluenose is on all our dimes. I'm a Prairie girl and the closest life size tall ship we have out here is the Hudson's Bay commissioned full size replica of the HMS Nonsuch which sits in the Manitoba Museum in Winnipeg, Man. A 90 foot gallery alongside gives the authenticity of being in the 17 century English port of Deptford. I missed the Tall Ships whenever they’ve been on the coasts but I heard something about them plying the waters of the Great Lakes this summer so I might just have to take a trip back to my birth province of Ontario to check them out. Me: I want to join the Navy. The recruiter: Canada doesn't have a Navy. The 3 branches of the armed forces are combined into one. Me: But we have ships. The recruiter: Females aren't allowed on the ship overnight. Me: How am I supposed to have a guy in every port if I can't live on the ship? The recruiter: His mouth dropped open and he shrugged. Me: Okay, what else you got? And that began my 20 yr stint in the CAF as a teletype operator. And yes, I was ‘born again’ at the time. I was just...adventurous. Thanks Susanne, it's great to be here. And thanks for the wonderful review on your blog! Debra, I'd love to visit Boston! Savannah is also on my list. I'm thinking of writing a story located in that great southern city. Thanks Karen L and Karen K for stopping by! Hi Carla, so you know what I mean about the Bounty! What a grand ship! Sigh, it's still raining here in Sunny California. I guess I prefer cruise ships ;) The Raven Saint looks like an amazing read! Congrats. I was lost in writing world yesterday. Sorry I didn't stop by much. MaryLu, if you're still out there, I was wondering who are your favorite hero and heroine that you've written so far. Favorite hero and heroine? It's hard to choose, but honestly, I'd have to say Captain Merrick and Lady Charlisse from my very first book, The Redemption. The redeemed pirate and the heart-broken damsel in distress. Charlisse's journey to find her earthy father mimicked my own journey through life until I met my heavenly father. And what's not to like about a godly pirate?